Remember when One Story didn’t have an entertaining and wonderfully informative blog? Before we could tweet all of our exciting news straight to your computer screen? In an effort to fill that technological gap, we’re revisiting some old issues to remind you that before we were blogging about it, we published some talented writers you may have missed! Today, I bring you back to Issue #15: “Smoking Inside” by Darin Strauss (January, 2003). After reading “Smoking Inside” and setting it back on the table, away from me, my heart is still pumping and anxiety-ridden for the story’s protagonist, single mother Nanette McQuaid. Strauss portrays the unfortunate repercussions of placing an eBay ad for bratty children in a moment of motherly frustration. Nanette’s perspective of the world unleashes Strauss’ strong understanding of how people are quick to judge and the lines of social class. A reader can fully appreciate the motherly love and the honest humor consistent throughout the story. If you signed on as a One Story fan post-Issue #15, I strongly recommend you pass the time between current issues by picking this one up instead of obsessively checking your mailbox everyday in anticipation for the next one! Since his 2003 publication in One Story, Darin Strauss has been very busy, and this certainly has not gone unnoticed. In 2008, he released his third novel More Than it Hurts You, which earned him a Guggenheim Fellowship as well as several Best Book of the Year awards. That summer, Strauss appeared on the public radio show/podcast This American Life in which he told the story of his teenage car accident that resulted in the death of a classmate (click here to listen to the recording). Through dealing with this traumatic event and attempting to make sense of the deep effects it had on him, Strauss completed his memoir Half a Life in 2010. The book received smashing reviews, more Best Book of the Year awards, and the National Book Critics Circle Award for Autobiography. 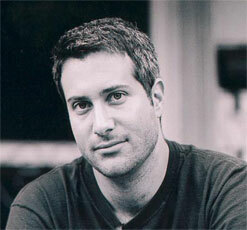 Strauss lives in Brooklyn and teaches creative writing at New York University. He will be a craft lecturer in our 2011 Summer Workshop here in Brooklyn next week. To learn more about Darin Strauss’ writing process, check out our Q&A with him or click here to order “Smoking Inside”. As an editor I am amazed you published the ungrammatical “The Joy of Cooking,” (issue #152). Two daughters (Paige and Emily, in this sad case) are not “the oldest and the youngest.” They are, correctly, “the older and the younger.” Tsk, tsk.